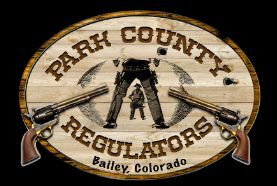 Many thanks to the Park County Regulators for their help in spreading the word about Fire Adapted Bailey and our crowdfunding efforts. When we came to realize that our most urgent need was cleaning up our critical county roadways for a safe evacuation, we had no idea that it would lead us into the uncharted waters of a major crowdfunding campaign. Having little idea of the how and what of crowdfunding, we plunged ahead with a goal of raising $100,000. As of last week, we have raised over $20,000 and today we have a very generous “Santa” match of $5,000 to take us to the $30,000 milestone. Since our kickoff event in October we have experienced an outpouring of support from the community. The Platte Canyon School District and Platte Canyon Chamber of Commerce have both helped get the word out via their email lists. Many of our homeowners have made generous individual donations. Our campaign has raised wildfire awareness and caused people to look at the fuel loads along our roadways in new and critical ways. Final hours to take advantage of the tax year with your donations and our current dollar match! Come learn more about the critical importance of safe evacuation in the event of a wildfire, this Wednesday at Mad Jack's in Bailey. 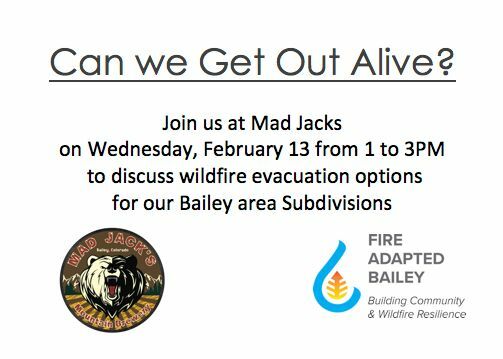 We are working on events like this at times more convenient for working folks, but if you have the time on Wednesday afternoon, please drop by.